03/28/91 Mariott City Center Ballroom Minneapolis MN "KTCZ Listener Appreciation Party"
05/? ?/91 Jubilee Jam Jackson MS exact date unknown - "third weekend in May"
05/25/91 Mainstage, Strawberry Music Festival Camp Mather CA "An Acoustic Evening With Los Lobos"
7/? ?/91 University of Texas Austin TX "Austin City Limits"
08/11/91 Gallagher Park Edmonton ALB "Edmonton Folk Festival"
08/15/91 Munn Field, Michigan State University East Lansing MI "Michigan Festival"
08/21/91 Ed Sullivan Theatre New York NY "Late Night With David Letterman"
09/13/91 Nevada County Fairgrounds Grass Valley CA "Harvest Ball"
09/14/91 Zellerbach Hall, U.C. Berkeley Berkeley CA "An Acoustic Evening With Los Lobos"
11/01/91 Laxson Auditorium Chico CA Chico State University - "An Acoustic Evening With Los Lobos"
11/02/91 John Van Duzer Theatre Arcata CA Humboldt State University - "An Acoustic Evening With Los Lobos"
11/03/91 The Catalyst Santa Cruz CA "An Acoustic Evening With Los Lobos"
11/06/91 Orchestra Hall Chicago IL "An Acoustic Evening With Los Lobos"
11/07/91 Macbride Auditorium, Univ. 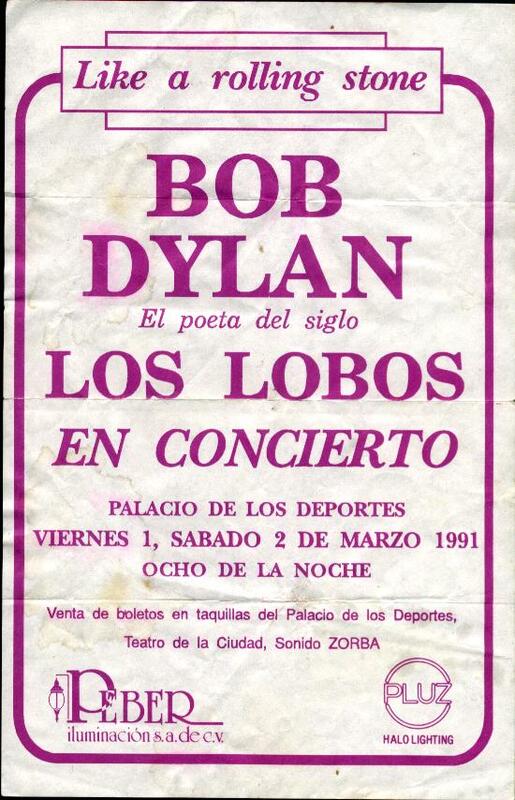 of Iowa Iowa City IA "An Acoustic Evening With Los Lobos"
11/08/91 Cinemobile Cafetal Caracas VNZ Miguel Rios, LA Union, Soda Stereo and Fito Paez Also Performed Cancelled? 11/09/91 Cinemobile Cafetal Caracas VNZ Miguel Rios, LA Union, Soda Stereo and Fito Paez Also Performed Cancelled? 11/10/91 Cinemobile Cafetal Caracas VNZ Miguel Rios, LA Union, Soda Stereo and Fito Paez Also Performed Cancelled?